Happy New Year everyone. This is the annual review time! Here are my choices for the year, not concerned with the opinion of the critics. There is absolutely no doubt about this one, and even as I haven’t reviewed it yet, there is no shortage of some good opinions about this one. I was pretty late in realizing this movie’s abilities. I might write about it sometime later. This one has Dulquer Salman and Nazriya Nazim, and that star combination has somehow managed to bring so much boredom to the viewers that its success is only in being the worst movie of the decade. Thinking that this is Dilwale Dulhaniya Le Jayenge, and coming up with cheap jokes and stupid imitations, this movie has two dumb protagonists falling in love with each other, and the good guy getting nothing while the shameless pseudo-hero gets the girl. Noah’s horrible drag supports only the bloody nonsense that it shows on screen and despite the deviation from the Bible, it hasn’t found anything interesting for Christians or Non-Christians. My friends get scared of the name “Noah” because of this movie. This movie’s unnecessary glorification of cricket and its players is rather boring, repetitive and should be an invisible hope for match-fixing as well as a purely money based sport which is beyond the common man’s grasp. This is the biggest collection of meaningless drag becoming rather a drift with unbelievable amount of ridiculous stuff which has only Hima Qureshi and a nice twist; everything else is complete waste of time. As it keeps dragging, the movie has nothing that invokes interest except for its silliness which is beyond the borders of the horizon, and its dumb, fake love is glorified like that of Twilight and similar nonsense stuff. As the one movie which seems to have Priyanka Chopra forcing the viewers to hope for the death of her character, but goes on only to reach the much expected end which is not much different from the beginning of the movie – not worth it. This movie becomes a big love lie with a strange beginning involving Parineeti Chopra who rarely manages to be not irritating in her new avatar which ends up glorifying the process of stealing at home and also brings up pseudo-love supported by stupid comic scenes. Here comes Besharam’s evil twin which is so stupid that its collective dumbness makes the equal of foolishness that Ranbir Kapoor’s character had come up with . A more appropriate title would be Main Tera Zero: Irritating Version. Yaariyan almost took this title away. As one of those movies which makes the viewers suffer so much, this can have the title of being the worst movie of Mammootty, Aashiq Abu and the worst gangster movie of this century, a record which might not be broken for a long time. Yaariyan wanders here and there, exhibiting stupidity all the way from India to Australia with a rather racist tone in targeting another race, nation and continent glorifying one culture over the other and proclaims its cluelessness. Coming to the theatres with such huge hype, what it delivers can be considered as terribly boring and never anywhere close to being good. Its central idea itself doesn’t work, and there is no point in anything else. *This is only based on the movies I have watched. **89 movies watched on the big screen this year, with 66 of them reviewed. 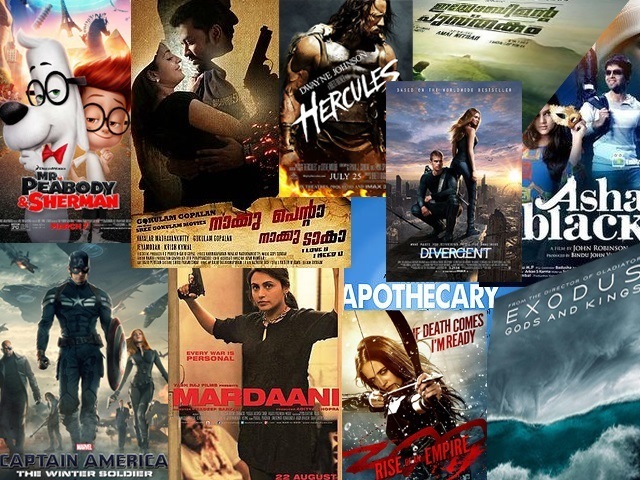 There were 44 English movies, 32 Malayalam movies, 10 Hindi movies and 3 Tamil movies. Total Reviews including honorary ones = 73. **103 movies watched on the big screen last year, with 71 of them reviewed. There were 44 English movies, 43 Malayalam movies, 12 Hindi movies and 4 Tamil movies. Total Reviews including honorary ones = 109. Happy New Year Teny 🙂 and have a great 2015 full of movies that you will love to watch… we all are looking forward to your reviews on it and be happy always. Thank you so much for the info(s) you share here. God bless you! Nice wrap-up Teny! Happy New Year!